FARMINGTON - Flora Pearl O'Connor, 80, of the Holley Road in Farmington, passed Wednesday, Sept. 5, 2018, at her home with her family by her side. She was born in Brighton, Mass., Sept. 6, 1937, a daughter of Joseph Reginal and Angeline (MacDonald) McIsaac. On August 30, 1958, she married Robert O'Connor, the love of her life, and they made their family home on the Holley Road for many years. He passed June 17, 2011. Pearl was a local celebrity having touched many people's lives as she worked at Hannaford Supermarket in Farmington for 38 years, retiring on Dec. 23, 2014. She always put others before herself, loved family time, shopping, boat racing, and she especially enjoyed working on puzzles with her "Birthday Buddy", great-granddaughter, Cassidee. She is loved by her family: children, Kathy Poulin and her husband Rick of New Portland, Bob O'Connor and his wife Lynn of Farmington, and Joe O'Connor and his wife Letitia of Kingfield; grandchildren, Ricky Poulin and his companion Amanda of Kingfield, Kimberly Poulin and her companion Brandon of Skowhegan, Jason Poulin and his companion Teddy of Portland, Matthew Poulin and companion Mikaela of Kingfield, Larissa Moulton and her husband Thomas of Maple Hill, N.C., Tim O'Connor of New York, Ryan O'Connor and his companion Brooke of Belgrade, Holly O'Connor of Bar Harbor, Lauri O'Connor of Bangor, Morgan Spaulding and fiancé Bradley of Augusta, and Emily Stone and her companion Gavin, of Jay; great-grandchildren, "Birthday Buddy" Cassidee Moulton, Gunnar Moulton, and a new "Birthday Buddy", Hudson Grant Poulin, born Sept. 6, 2018; siblings, Margaret Helen Priest of Clinton, Mass., Joan Camelli of Milford, Mass., James McIsaac of Watertown, Mass., and Mary Arsenault of Fall River, PEI. 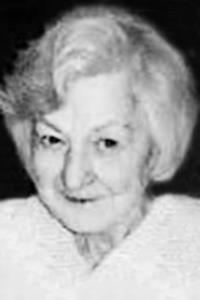 She was predeceased by a grandson, Patrick James O'Connor; and a sister, Frances Ann Stukey. The family would like to give a special thank you to her care givers at Farmington Family Practice, Androscoggin Home Health Care and Hospice and her nurse, Pranee, for their tender care. A celebration of her life will be held on Sunday, Sept. 16 at 11 am at her home, 709 Holley Rd. Cremation care has been provided by the Wiles Remembrance Center/Adams-McFarlane Chapel, 137 Farmington Falls Rd., Farmington. Condolences and tributes may be shared with her family on her memorial wall at www.wilesrc.com.